Over the past 3 winter seasons, the weather here in NH has been getting more and more unpredictable. We’ll have drastic temperature swings overnight. Snow will turn to rain, then to freezing rain and back to snow. Huge melts which leaves terrain coated with ice. Then snow. Then rain, etc. 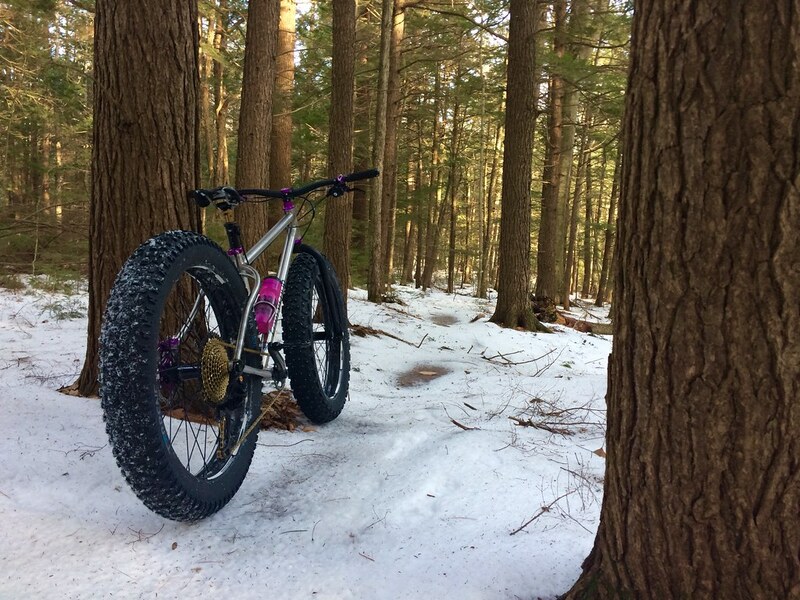 Basically, our winters have been tough to get consistent riding conditions on a fat bike. I’ve been jonesing for a set of studded tires because of this trend. But what I’ve come to find in my neck of the woods is our local trails don’t get ridden all that much during the winter. Often times, I’m laying first tracks and breaking trail. We have plenty of snowshoers and hikers, but that seems to happen a handful of days after it’s snowed. So I’m breaking trail. Or at least the two trailheads I frequent, I find myself breaking trail. 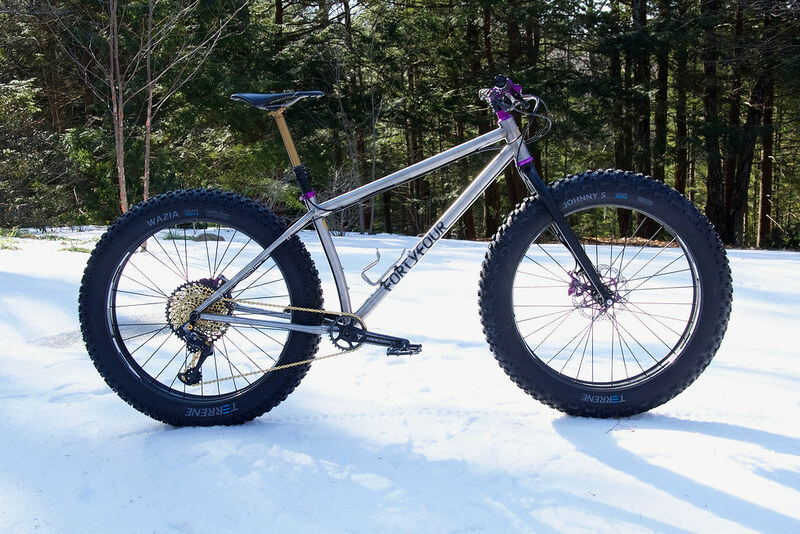 That means I need two qualities in a fat bike tire: I need a large tire (4.5″) to create a wide contact patch to enhance float and I need tall lugs to bite into that fresh snow to maintain traction. Surly’s Lou has both of these qualities. But it’s not made to be studded. You can do a DIY stud but I was waiting for a tire to come along that combined all the right nuance I was after. Terrene’s Johnny 5 and Wazia 4.6 Light Studded combo appears to be that magic combination of size, aggressive lug, and studs along with siping to increase surface area. First ride out, I have to say I’m incredibly impressed. Conditions of the loop I rode yesterday were absolutely terrible. There is just no way I would have been able to ride even half of the trail I rode yesterday if it had not been for studs. So let’s dig in and check out what makes these tires and my new set up tick! Both tires were aired up to 20 psi and left like that for two days before I headed out to the trail. One thing you’ll note is the aggressive tread pattern of both with fairly tall knobs. The Johnny 5 has a knob configuration with a center lug while the Wazia 4.6 does not have a center knob. It’s a bit more of an open tread pattern. Studs are what they call their “Triple Traction”. 320 studs to be exact for the Johnny 5 and 154 the Wazia 4.6. A big difference between the two tires is Johnny 5 incorporates some siping. I wish the Wazia had siping as well as it would effectively increase surface area and hence traction. I’d also argue that Johnny 5 could include a bit more siping but both tires proved pretty formidable against the terrain and conditions I was tackling. Once at the trailhead, it took a good 15-20 minutes of a little pedaling and releasing pressure to finally arrive at a good running pressure. 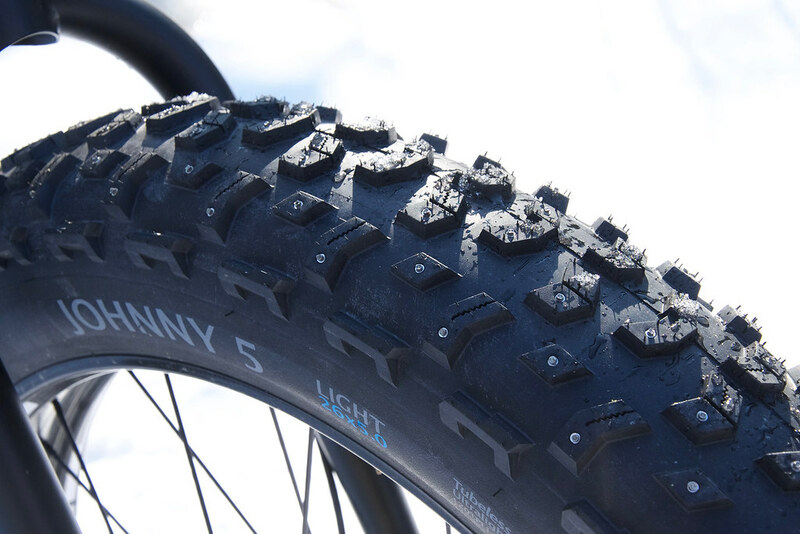 The tires are supple and a bit different in feel than the Surly Lou’s I was running previously. But once I had tire *pressure figured out, traction really started to take hold as it should! (*Editors Note: Once home, the front tire measured out to a cool 5 psi while the rear was just shy of 6psi.) One note about the terrain here near the shop is that it is incredibly rolling with a lot of steep, short climbs. You need to maintain forward momentum, stay balanced and not break traction to make it up some of these short climbs. 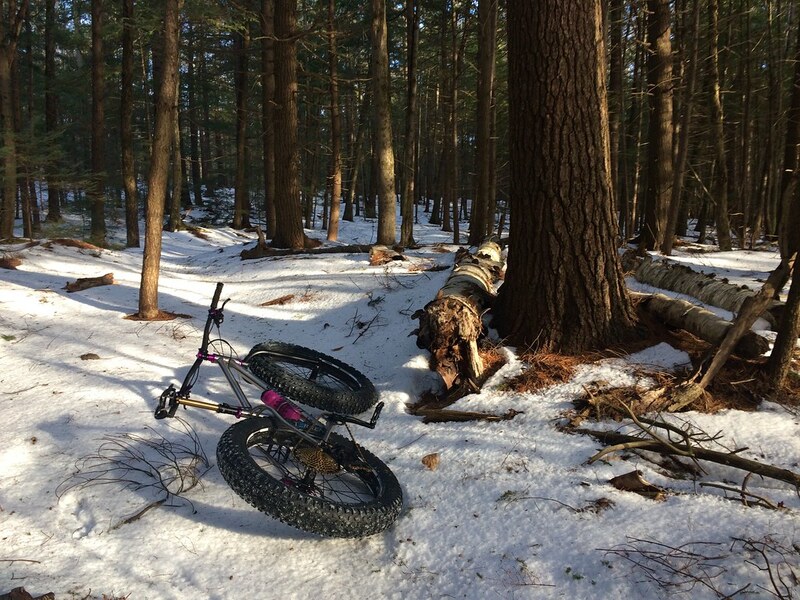 Now if you’re breaking trail, and there’s a crust, anyone who’s ridden a fat bike will appreciate just how difficult that can be sometimes. 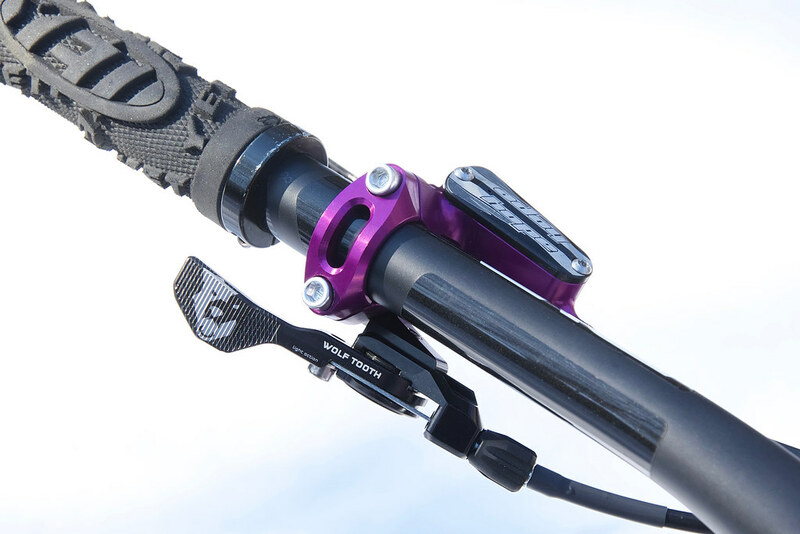 You can pedal, but if one of those 3 elements cuts loose… you’re stalling. One of the biggest changes I made to my overall set up as I went from a Sram XX1 11 speed drivetrain with a 42t cog to an Eagle 12 speed 50t cog. I was a bit skeptical about that 50t and wondered just how useful it would be over the course of the ride. I was also wondering if my choice of a 28t chainring was still relevant and if I could jump up to a 30t chainring. Well, first steep climb found me up on that 50t and I have to say, from here on out during the ride I was all over that 50t! It made a lot of climbs possible that I would have had to walk in previous setups. There’s just no way I could have maintained traction and forward momentum had it not been for that cog. 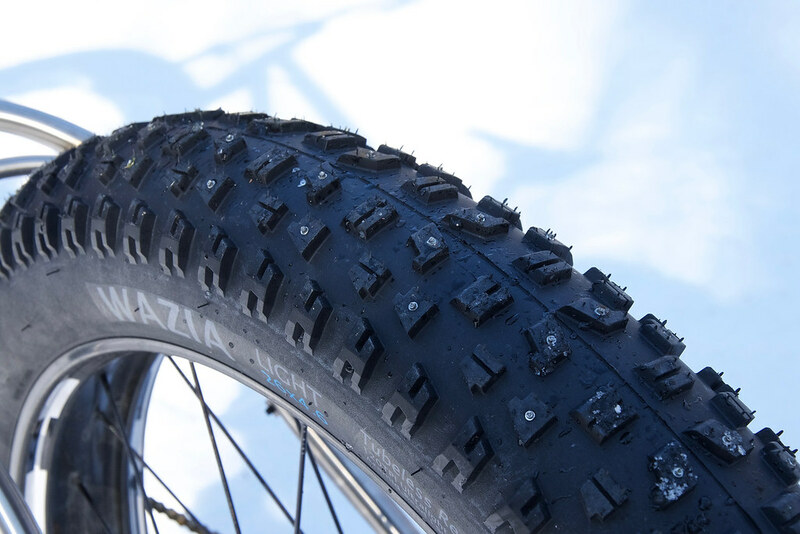 Maintaining traction was essential and thanks to the studs on both of these Terrene tires, I was riding wherein the past, I would have been walking. And with the current conditions, I don’t think I actually would have been able to walk some of those sections it was that icy. Aside from the geometry changes mentioned above, and the addition of a 12-speed drivetrain with a 50t cog, I also knew I needed (yes, NEEDED) a dropper on this build. 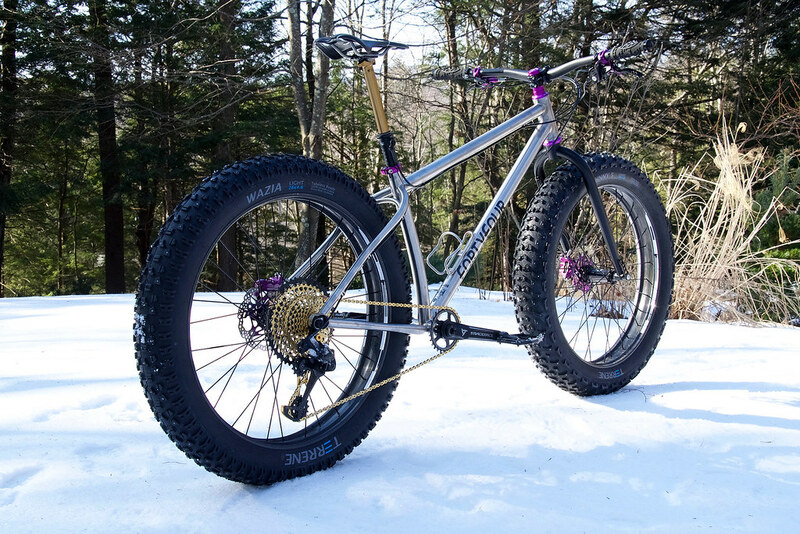 One of the subtleties of riding a fat bike is getting your center of gravity low. 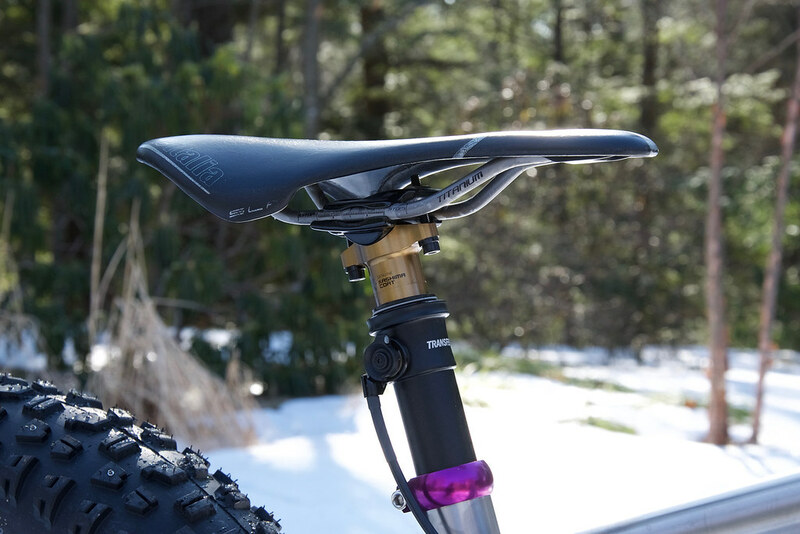 76mm / 3″ of drop really helps that cause but in some conditions, I’d actually sacrifice leg extension over lowering my saddle by a bit to maintain traction and control downhill. With a dropper, I can do that on the fly. Temperatures this ride were in the mid-20’s to 30’s. A previous ride there were around 10-15°. Put all of these factors together and add a layer of studded tires beneath you and boy was I having fun! Climbs were easier. Terrain previously considered unrideable was totally rideable! And I’m talking some seriously terrible conditions. I can’t emphasize that point enough. There were some situations where walking or dabbing were just not an option. That would have been an entertaining dance! What I did find was that the tires just plain stuck to the ground. 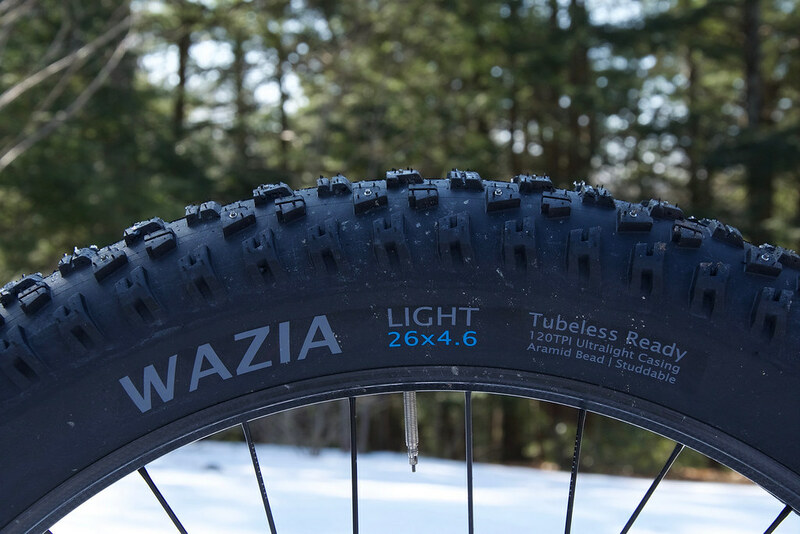 The Wazia 4.6 had good traction and I believe I spun out once due to a bit too much pedaling force but because of the changes mentioned above, I was able to quickly bring the bike back upright and under control. I think I had to step off and walk 1-2 sections during climbs because it had been going on for some time and it was steep and my toes were freezing up so I needed to walk to get things moving deep into the ride. But when it mattered and I had to maintain traction, both of these Terrene tires exceeded my expectations with overall traction, float, and aggressive bite. 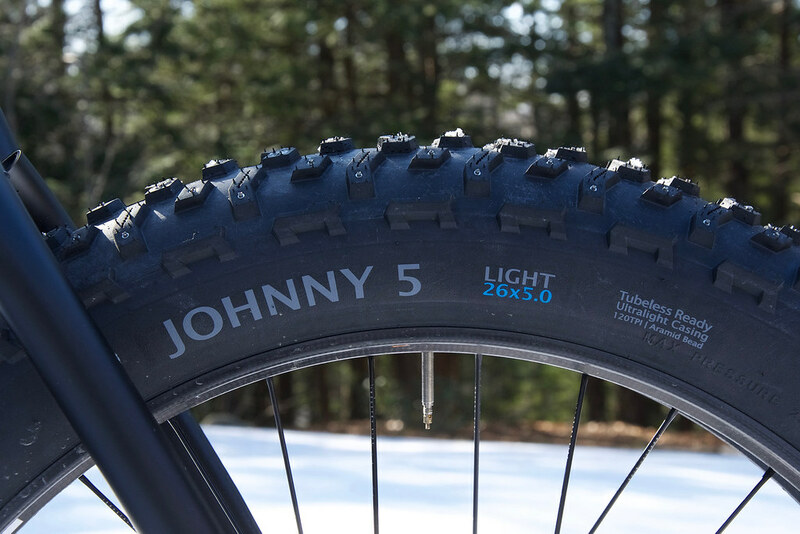 The Johnny 5 is one seriously large tire with gobs of traction and stability. The extra siping is a smart feature to increase overall surface area. Like I mentioned previously, I think it could even sport more and the Wazia could share some of that siping design details. But overall, I’m quite pleased with their performance and their sheer ability to allow me to ride when previously I would have been sitting at home cursing the weather. Give them a closer look at Terrene’s site!